Every three months the Council publishes the payments made to Capita. I thought it might be useful to shine a bit more light on one of those payments, gainshare, the £8.3 million bonus that has been paid to Capita so far. provisions of Schedule 15 (Special Projects Approval Procedure)"
In plain English what it means is that if Capita make a savings on a project, exceed an agreed target or negotiate a better purchasing deal they get a share of those savings. On the face of it that seems reasonable but as always the devil is in the detail. The contract included specific guarantees of savings and my original thought was that gainshare would only be payable on the savings over and above those guarantees but that is not the case. This means, for example, that Capita were able to claim £5.9 million of gainshare payments on procurement savings while Barnet received just £1.36 million above the guarantee. That doesn't look like a fair share to me. Independent Advice and Advocacy Services. Now to be fair, council staff disputed the savings made on Domestic Violence Services and Return Home Interviews and subsequently Capita had to issue credit notes for those payments but the fact that they were paid in the first place is very worrying. If you can save some money by buying a standard commodity product, like a laptop computer, somewhere cheaper then I am sure most people wouldn't argue with that so long as it is the same computer. When you start looking at services for the vulnerable there is a real risk that the savings have a direct impact on the service offered. The problem is the contract is heavily incentivised to make these savings and that may prompt actions which are undesirable and risk reducing the quality of service. The lion's share of the gainshare payments have been paid on the Comensura contract who supply all the council's agency and interim staff. (£1.26 million), London Highways Alliance Contract which provides road repairs (£500k) and saving on gas and electricity (£313k). To be clear, this is not the total saving but merely what is paid to Capita. It is also important to note that the payment is not made against savings actually achieved. It is invoiced up front on forecast savings and at the end of the period they have a "true up" which compares the savings claimed up front against the actual and either further payment is made or a credit issued by Capita. Looking at the example of the Gas and Electricity savings you can read the basis for Capita's claim here. Capita have claimed a saving of £942,000 made up of actual annual energy savings of £111,071 plus £202,420 of "corrected overcharges". They then gross up the three years of potential savings and send Barnet a bill for £313,000 as their share of the savings. To my mind this is a serious manipulation of the actual savings that could be justified given that if a procurement department was doing their job properly overcharges would get picked up in the normal day to day review of invoices. I am so concerned about this claim that I have raised it with the external auditor and I await his response. Normally this whole gainshare process is entirely opaque but as I remain concerned about how much is being paid on this clause I make sure I examine the details. Some people will say that it shouldn't matter as it is better to get 66% of something than 100% of nothing but if we had a well resourced council run procurement department then all that saving would be retained. Just think what the £8.3 million could mean if that was coming back to Barnet instead of supporting Capita shareholders. Last night we had the re-run of the Barnet Audit Committee, this time with a largely complete audit report. I blogged about the previous meeting here. Most of the issues identified at the previous meeting still exist but we now had a largely complete report with just a few odds and ends in need of completion. Before the meeting got under way the Chair of the committee Cllr Hugh Rayner made a statement, one which was critical of Capita's performance and one which sought to build bridges with the external auditor after the unjustified pummelling they received from certain Conservative members at the previous meeting. He said that the reason for the late production of the audit report was not just the external auditor's (BDO) fault but the format in which Capita had provided the information to BDO "almost as if Capita were talking to BDO in a foreign language". He noted that there would be a service credit (a penalty) to be paid by Capita of £55,000, some or all of which may have to be paid to BDO for all the extra and unbudgeted time they expended to get the accounts into a usable format. He praised BDO "for doing a magnificent job in difficult circumstances". Cllr Rayner went on to say that he was satisfied by the financial state of Barnet but not about the process of collecting financial data and that he was commissioning a review to be carried out by the Section 151 Officer to understand what happened and to bring that review to the November audit meeting. I mention all of this as it seems unprecedented in Barnet's history and suggests some very serious problems have been encountered. Normally this would not have been so openly addressed so it is refreshing to see Cllr Rayner be so open and transparent about this. Next up were three of the Barnet Bloggers, Barnet Eye and myself who addressed the committee, and then Mrs Angry as well for the questioning. As is so often the way, comments are received in silence and questions dealt with in a perfunctory manner. Often answers are supplied but not necessarily to the question asked. A copy of the questions and the answers provided can be read here. After the questions, the Partner from BDO went through their report page by page. The key issue that became apparent is that the auditor can still provide a true and fair judgement on the report if the variation is less than 1.5% of the total council budget which the auditor said was in the region of £13 million pounds. That may seem a small amount in audit terms but that is a massive amount in terms of the amount raised through Council Tax (9%) and to set it in context the cuts to the library service were aimed at saving £2.3 million. This becomes more important when the issue of bad debts were discussed. This included a debt of £4.6 million from Re, the Capita joint venture. It appears that this is a shortfall against guaranteed income targets. The auditor said that he was satisfied with the management representation that the debt is recoverable even though nothing has been billed and no confirmation of liability has been received from Re. At this point the Partnership Director from Capita spoke to say that he "acknowledged the disputed £4.6 million" but that would be subject to debate. My interpretation is clear, that the chances of recovering all £4.6 million are slim to nil. When the auditor was questioned he made the point that all of it or none of it might be recovered but because it was below the 1.5% threshold it didn't matter from an audit perspective. The auditor has covered his backside and preserved the auditors professional indemnity cover by getting management to make a signed representation that it is recoverable but the sum is still at risk. Interestingly Cllr Finn made the point that Capita compiled the accounts which recognised the debt and Capita owed the money therefore they must recognise the debt. Unfortunately, it doesn't work that way although it highlights the massive conflict of interest of having a contractor that owes money who also prepares the accounts. There were many disturbing comments raised during the meeting but perhaps two of the most shocking were both on the same subject, one made by the auditor and one made by an independent member of the audit committee. First of all the external auditor said when discussing the use of reserves that in the medium term till 2020 the council could manage its budget drawing off reserves but after 2020 the council "will need a complete re-write of what you do" if there is any hope of balancing the budget. This was then reinforced by the independent member Richard Harbord. Now Mr Harbord rarely speaks up and some may wonder why he is on the committee but he is a local government finance expert having previously been a local authority CEO and is a regular contributor to a local authority finance website Room 151. He confirmed that indeed after 2020 local authorities "haven't got the faintest idea how they will be financed in any way shape or form". He made the point that so many changes to local authority finance need primary legislation but the legislative timetable was full because of Brexit. The Director of Resources also made the point that they don't have enough funding to meet next years requirements and that is why further cuts are on the way. It looks like we are in a complete mess and based on both Mr Harbord's and the external auditors comments this must be the biggest single risk to the future of the council. Towards the end the external auditor was asked how Barnet rated compared to other local authorities in the preparation of their accounts. I suspect some councillors were expecting a positive answer but no. Some clients could be worse than this "but taken in the round I would put you on the not so good step of the range I am dealing with". To be clear, the audit process has been a mess, there are "loads of issues" as noted by one committee member, which need to be addressed. There will be a review document in November but it will be essential to see how any action plan addresses these problems. My concern has always been that having such a key function as finance run by an external contractor, Capita, creates divisions, barriers and risks that key financial actions will not be undertaken properly. The fact that Capita are in effect being fined £55,000 for their miserable performance at this audit must raise doubts about their ability to continue to provide the financial function for the council. At some point in the very near future I believe that councillors will need to consider taking the finance team back in house where there can be proper control and insight into this vital function. The interchangeability of Capita and LBB staff makes for confusion and a real chance that matters get missed or fall down the cracks between the two organisations. I will report back after the November meeting but watch out for a series of blogs coming up in the next week or so. estates, and corporate programmes. As this is a significant prepayment, we challenged management with regard to its basis". I have been raising this issue every since the contract was signed so it is good to see that the Auditor has now questioned it. The first prepayment made but the council's continuing desire to throw money at Capita was compounded in November 2016 when councillors agree a further advance payment of £26.9 million. In July Barnet paid Capita £4,026,345.08 (which included Capita employee benefits of £2.68 million) and paid Re £1,760,758.67. Set out below is the running total paid to capita through the CSG and Re contracts from the start and you will realise how much extra Capita are being paid add-ons such as special projects, gainshare and contract variations. Barnet keep talking about the savings that Capita have made. They may have made savings on the core contract but all the extras are costing a fortune and as a net figure I see no savings whatsoever. Earlier this week I attended the Performance & Contract Management meeting at which I asked a number of questions about the procurement failure of the Enablement Homecare Contract. As is often the case, no criticism of Capita was allowed and even when Cllr Finn agreed with one of my points, he was stopped in his tracks by Cllr Zinkin who is the Praetorian Guard of the Capita contract. The debate then moved to the topic of Interim and Agency spend which has seen a decline from the high point of last finance year. It is nevertheless still very significant and, as Cllr Edwards pointed out, how is that agency spend going to be affected once Brexit happens? To set this in context the chart below illustrates the huge growth in Interim and Agency staff spend over the last 5 years. It was always envisaged that the Interim and Agency staff spend would decrease after the two large outsourcing contracts were signed whereas in reality it has continued to grow year on year to the point where it has become a massive embarrassment for the council. Steps have been taken to try and reduce this spend and my latest forecast for the year end spend look like the outturn will be around £16.5 million down on the £19.88 million of last year but still double what it was in 2011/12 and we still have 8 months of the financial year to run. I would also note that the Interim and Agency spend has a nasty sting attached. At the year end 2016/17 the council stated that the agency spend was in fact £21.194 million a difference of £1.3 million over the spend shown in monthly payments. This did puzzle me until I carried out my inspection of the accounts when it became clear that Capita were paid £1.3 million in Gainshare payments for "savings" made on the interim and agency contract with Comensura. 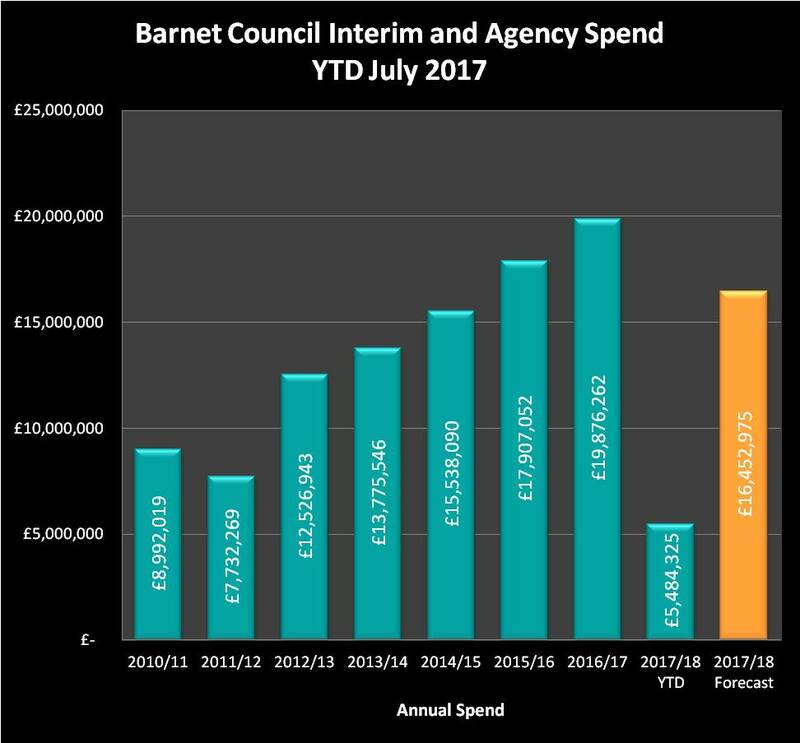 I have still not been shown the evidence to support the claims of these savings but Barnet is quite happy to pay Capita £1.3m on top of the £19.88 million paid to the agencies and that, I believe, is why the Council's figure is higher. I have raised this with the external auditor and I await his findings. The last point to make is that Capita are the council's HR provider and one would have hoped they would have come up with some clever recruitment strategies to bring in more permanent staff and reduce the use of agency staff. Perhaps this is the re-run of their recruitment role for the Army which has turned out to be a disaster. Or maybe they quite like the gainshare payments which are directly linked to the spend on agency staff - the more agency staff the more gainshare payment. According to Rightmove, last year most property sales in Peterborough involved terraced properties which sold for on average £141,356. Semi-detached properties sold for an average price of £175,686, while detached properties fetched £272,491. 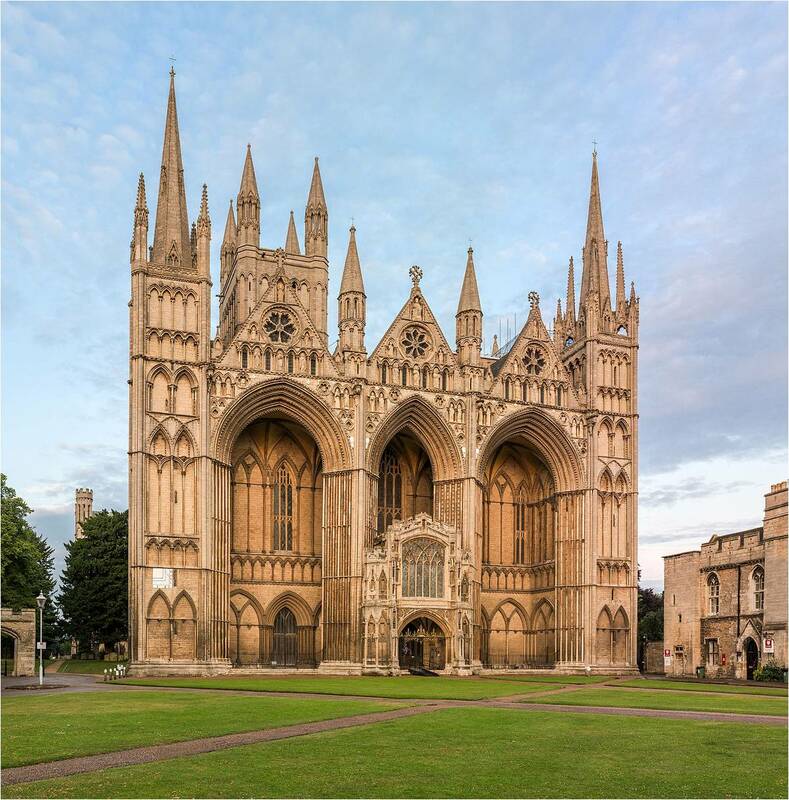 Wages in Peterborough are below the UK average but it is nevertheless a growing city. So what you may ask? Well clearly the officers at Barnet Council think Peterborough is a great place to live because the Council are spending millions buying property there. With an official duty to house the homeless in temporary accommodation and with property prices growing ever higher in Barnet, the Council decided in May 2017 to spend £8 million buying properties outside the borough. Relocating people out of London isn’t something new. During 2015/16, 233 households were placed outside of London by Barnet Homes and Barnet purchased 48 properties of which 28 were in Bedfordshire - many in or around Luton.What’s new now is that Barnet are spreading the net much wider and further away from Barnet. These new properties will be let and managed by Barnet Homes. Delegated powers reports reveal that 30 properties have been purchased so far of which 23 are in Peterborough. For those families who are housed there “temporarily” it may be that they are glad to be in such a thriving, growing area. But I suspect that for many the 76 miles may seem a long way if they have children in school, or jobs, or a support network of family and friends in Barnet. 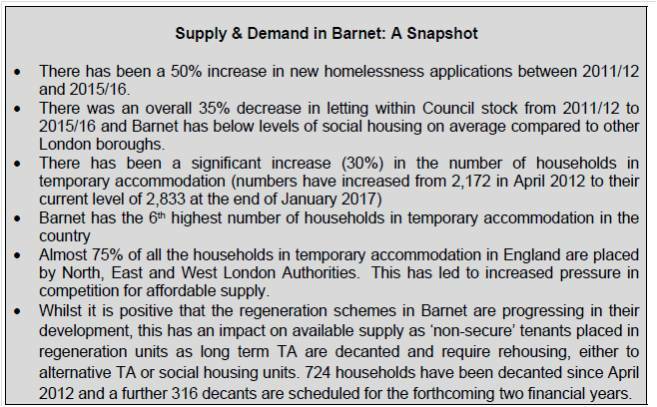 In the original report presented to the Policy and Resources Committee Barnet Home provided a summary of the housing situation in Barnet which makes grim reading and illustrates the failing of the current housing policy. Interestingly the officer's report states that "women and members of Barnet’s black and minority ethnic communities are over represented among those living in temporary accommodation. Over 70% of households in temporary accommodation are from non-white households, compared to around 40% of the Borough’s population as a whole. Of those in temporary accommodation the main applicant is female in 65% of households." However the report also states that "a full equalities impact assessment was completed for The Housing Strategy 2015-2025 which identified that the Strategy would have a positive impact on all sections of Barnet’s Community". I struggle to see how shipping single mother families so far from Barnet is a positive step. But I am sure you will all be saying "but it must save a fortune?" Well the report suggest otherwise. Existing temporary accommodation rental rates mean that for each new household placed in 2-bed emergency temporary accommodation costs the Council almost £2,400 net per annum. With bad debt provision and management costs factored in, this figure increases to approximately £3,400 net per annum, per household. Where rental properties are sourced outside London, these costs reduce significantly, however it still represents a net cost per unit of almost £1,900 per annum at current prices. By comparison, buying properties saves a whopping...... £3k over 30 years once borrowing costs are taken into account. I am not an expert and if I have got this wrong please let me know but simplistically this is my understanding. The reason the saving is so small is that Local Housing Allowance in Peterborough is £115/ week compared to £255 in Barnet. This means that while rents in Barnet are high so is the Local Housing Allowance the government pays. The difference between the two is what Barnet pays. 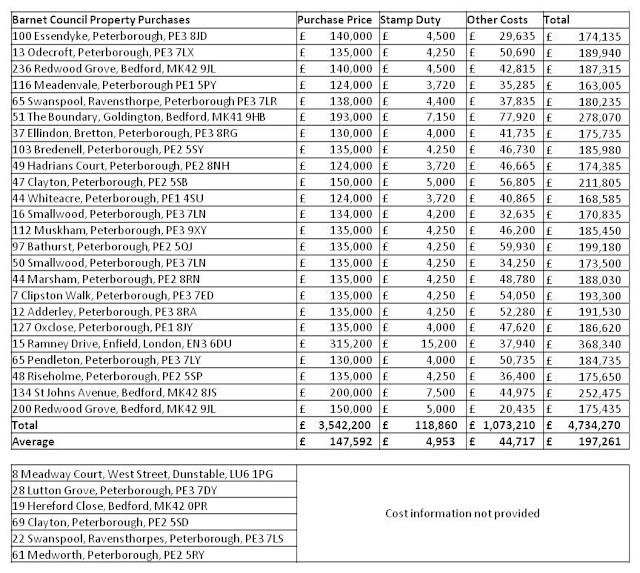 So, yes, buying cheap property in Peterborough saves the general tax payer money in housing benefit but the savings for Barnet are comparatively modest. That is where I might have ended this blog but as you will be aware I am interested in the details. In the original report it stated that the best case for refurbishment costs and fees would be £23,669 and worst case £31,890. So when the Delegated Powers report was published with the decision maker designated as Barnet's Deputy Chief Executive, the figures told a different story. Only one property came in at or below the best case for other costs and fees and another came in just below the worst case estimates. The other 22 properties all exceeded the worst case and in total the average other costs came in at £44,717, £21k above the best case and £13k above the worst case. Even taking into account lower purchase prices, the average cost is still £11k above the worst case total cost. This matters because the savings set out in the business case justifying the relocation of families so far away from Barnet are relatively modest and at this level it calls into question whether this is a viable policy. When I tried to ask Barnet Council for more information about these other costs they waited until my FOI was overdue and then told me Barnet don't hold this information and that all housing matters are dealt with by Barnet Homes. Well I for one hope that Cath Shaw, Barnet's Deputy Chief Executive, does know why these costs are exceeding the worst case and if she doesn't then that makes me worry even more. Lack of affordable housing is one of Barnet Residents' biggest concerns. Barnet Council don't want poor people and are happy to ship those families most in need to Peterborough. 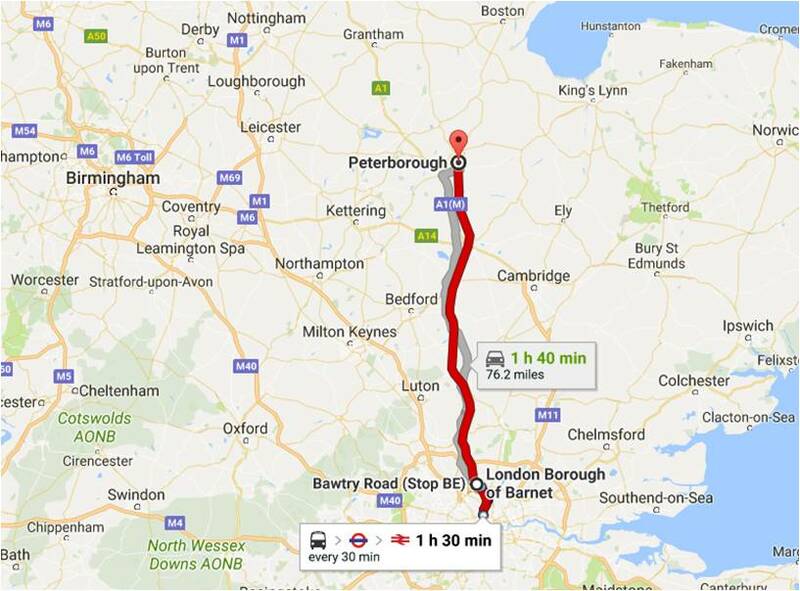 We need a radical change but shifting the problem to another borough 76 miles away is not the answer.